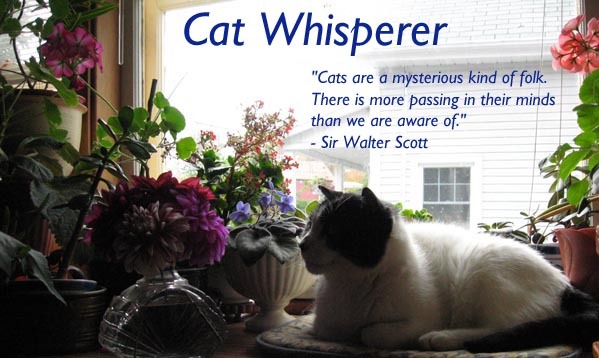 So, I am beginning to be convinced there is a kitty website with directions to my house - for cats use only of course. 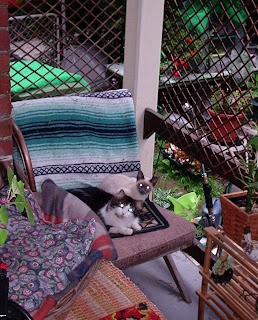 Check it out: this a a picture of my porch - but - these are NOT my cats! I fear they may be homeless, and the tabby and white, we've named Rascal, is limping. The Siamese is so tiny, and doesn't seem to be growing - yesterday he was on this same chair curled up with our Chaiyka, and alas they moved before I could get a picture - they looked soooo cute! This, on the heels of having "grabbed" Mr. Poole (2nd photo, a bit hard to see), and taken him to the vet. Oh - have I not told you about Mr. Poole? Well, he's been around well over a month and when he first arrived he was just black/brown fur and bones - totally ravenous. He's been living outside it seems, and we were prepared to leave things be since it is summer. However, a week ago, I was stroking his head and noticed a bump, which became bigger and bigger. OMG! An abscess - right near the eyes. Well, needless to say, that could not wait - and off he went to the vet, where he got fixed as well. He's "home" now, but really doesn't look good - his eyes have discharge, and he makes a "snuffly" kind of sound. I suspect we will have to confer with our vet again. Sigh. As always, there are more stories over at The Friday Ark and then Carnival of the Cats on Sunday. I think kitties know a loving sanctuary when they see one! They are adorable. Our foundling kitty, Naomi, is also tiny and I think she'll always bee a six-pound cat. Hope Mr. Poole is feeling much better very soon! Sam the Wonder Cat (more formally known as Samuel Herbert Miller II) just returned from a 4-day visit to the vet - he was diagnosed with diabetes and is now on insulin twice daily. He doesn't even notice when I give him his shot but it does complicate things since I will be in hospital in 2 weeks and he will need to be cared for by someone overnight. Back to the vet I guess. He hates my sister - truly he does!